A young couple poses on a park bench surrounded by lush green bushes with the mighty Portage High Bridge in the background. A nice souvenir of a summer day near the Portage Falls. The only catch is that they are not on the grounds of Mr. Letchworth's Glen Iris Estate - they are either at a local photographer's studio or at a fair booth with a painted background and an assortment of props! Ferrotypes, better known as "tintypes" became popular in the 1860s and flourished for the next few decades. Easier and cheaper to produce than other images, they were the favorite of photographers who could make them relatively quickly for tourists at street booths, fairs, and other gatherings. It is possible that these people were near the Falls - perhaps at the Cascade House attending the Soldier's Picnic at the Portage Bridge. Tintypes were not of the best quality, nor were they easy to label. Many had paper sleeves. These were often lost over time, leaving a lot of unknown folks such as the couple here. Who was the photographer? Did they or others have other backdrops depicting scenes from what is know Letchworth Park? 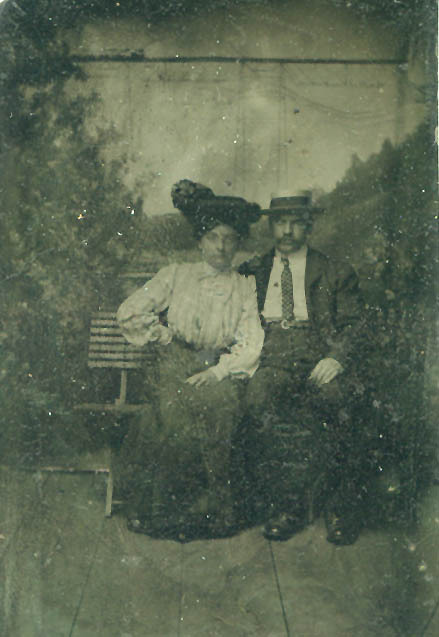 A second tintype appears below. Here is another group in front of what appears to be the same background. 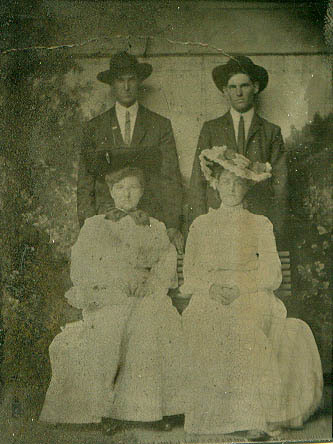 They are in much more formal dress, and could even be two generations of the same family. If you have some information or similar tintypes you would like to share, please send them along!